Don’t get so cocky, Red Bull! Mountain Dew always has and always will be chomping at your heels. PepsiCo’s citrus-flavored soft drink is more than just a beverage. 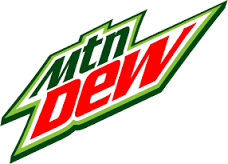 The current slogan of “Do the Dew” emphasizes it is a lifestyle brand that’s been strongly connected to niche markets for more than 20 years. The brand began in the hills of East Tennessee in the 1940s. In 1993, Mountain Dew began getting a feel for extreme activities, like skydiving and mountain biking. Jason Belzer wrote in a Forbes article that the brand has focused its sports marketing and sponsorship strategy on just one goal: being synonymous with the extreme. The bridge between rural consumers and young, active consumers was cemented by signing a sponsorship deal during the original X Games in 1995. In 2002, Mountain Dew started the Free Flow Tour, an amateur skateboarding competition. The Dew Action Sports Tour with NBC Sports began in 2005. Mountain Dew is building and strengthening relationships with buyers before and after competitions with movies, music, and online content. MD Films released First Descent in 2005. The documentary, centered on the rise of snowboarding, was the first motion picture produced by a soft drink company. The brand released “A Mini Mini-Series” in August 2014. According to the show’s YouTube page, users can watch all eight episodes in just two minutes. Green Label is the company’s online magazine “featuring the latest stories and emerging trends in skate, music, art, gaming, and more.” Green Label Sound is a record label for emerging artists, which recently launched the Green Label Station on iTunes Radio. Mountain Dew is even sponsoring the “Anything Goes Tour” for the country duo sensation Florida Georgia Line. The brand is effective in communicating through social media. Instead of buying airtime for a 30-second Super Bowl commercial, the company ran a spot for its new Kickstart line during the pre-game show and then continued the conversation with more than 10 million combined followers on Facebook, Twitter, and Instagram. Mountain Dew is highly successful in leveraging their sponsorship across brand communications. These niche markets appreciate the attention and are willing to reward the company by opening their wallets. Companies are using tools like PeerIndex and Klout to reach powerful thought leaders who can help promote the brand. A user registering for a Klout account will be asked to link their Facebook, Twitter, Instagram, Google +, YouTube, Tumblr, and other social media accounts. The service generates a score from one to 100 based upon follower metrics, amplification, and popularity. 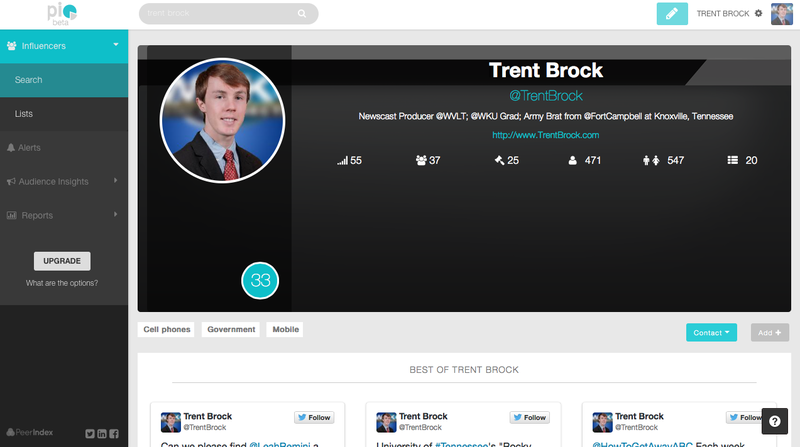 For example, my Klout score is 53 and I’m influential in business, shopping, and Kentucky. Amazon has the highest influence with a score of 98.86. Businesses pay to release “perks” (free services or products) to users based upon their scores, locations,and areas they influence. For example, I once received a $10 gift card to McDonald’s to try the McRib. In exchange for the free sandwich, the fast food restaurant encouraged me to share my thoughts on the meal with my social media community. PeerIndex is similiar to Klout, but it’s mostly a pay-for service that doesn’t release free offers. My score is 33, however, it would only connect with my Twitter account. This service includes a little bit more data than Klout, like measurement of engagement, approximate reach, and quality of followers. PeerIndex says I’m influential in cell phones, government, and mobile. 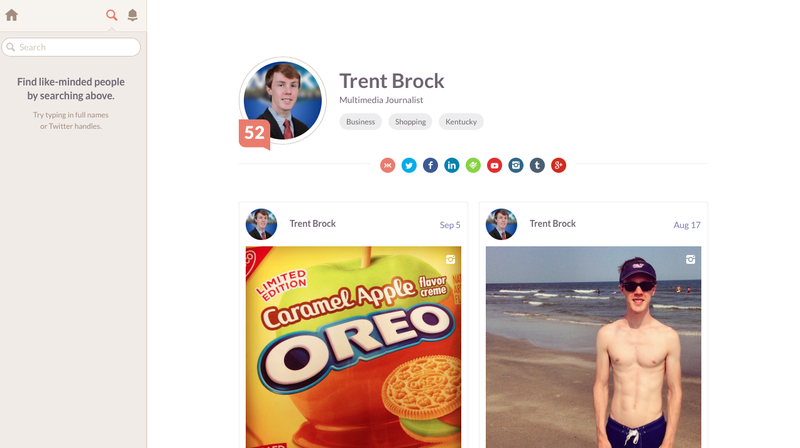 The website also shows my best posts, the accounts I’m influenced by, and the users I’m influencing. 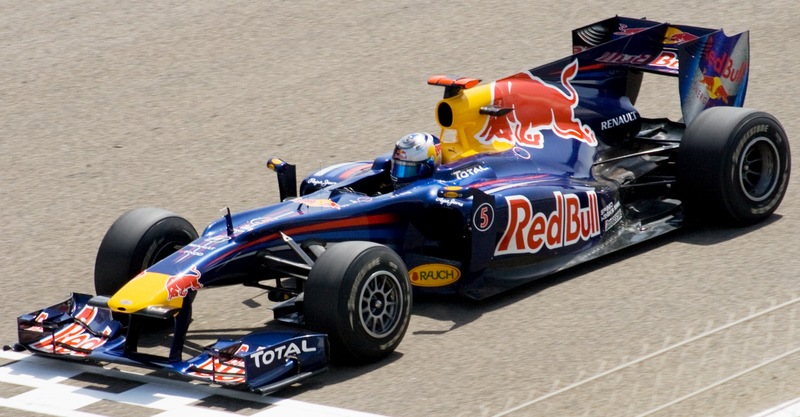 Sport brands can use PeerIndex and Klout to their advantage to directly communicate with powerful thought leaders. For example, teams could invite influential followers to a meeting where the organization will share that ticket prices will increase next season. The team would hope the folks with social media authority would be able to explain and convince the public that the increase is needed to recruit better players and make upgrades to the stadium. An organization could also send out hats or t-shirts with a new logo or catchphrase to influential people in the community to wear and encourage others to buy one. ESPN Magazine and Red Bull offer free publications to influential users in hopes they like the product and purchase a subscription at the end of the trial. The ripple effect of online voices is strong. Klout says more than 200,000 businesses are using the website, giving out more than one million perks. Brands should monitor these services to connect with social media leaders to grow into a more powerful position in the marketplace. A nail-biting finish for the University of Tennessee against South Carolina on Saturday. The Vols beat the Gamecocks 45-42 in overtime, clinching their first SEC victory of the season. Although the game was difficult, the team’s biggest challenge happens every day off the field. Organizations must find ways to keep fans engaged. When a team provides content, it generates attention and fan-interest. A recent Forbes magazine article highlighted Heineken‘s effort to put an umpire chair in the middle of Union Square. The company had volunteers, wanting to win tickets to the U.S. Open, sit and try to quiet passersby. Tennessee Athletics is great at sending out content via social media. 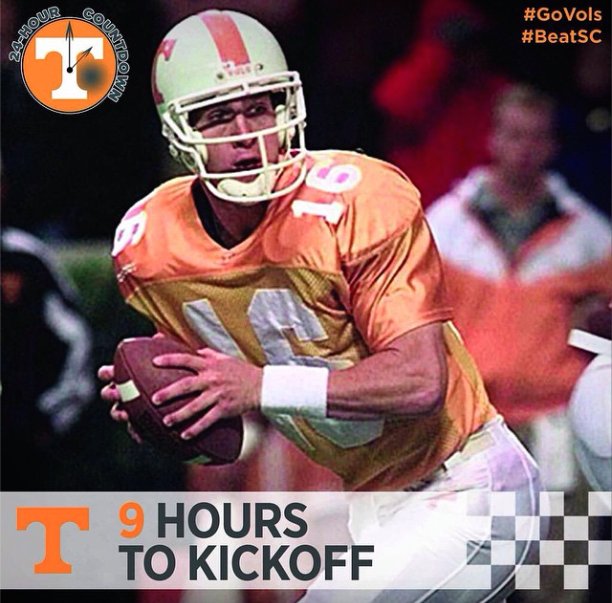 When the team is preparing for its next game, pictures are posted on the @Vol_Football Instagram account counting down the number of hours until kickoff. At the end of each quarter, pictures with the score are posted. When it’s a player’s birthday, a picture of them is posted to recognize their special day. The initiative is highly effective because even the casual fan feels connected and stays informed by simply following the team on social media. When they “Like,” “Retweet,” or “Share” a post, it shows up in their friends’ timeline and grows the audience. DIRECTV released a new advertisement over the summer, but it never aired on television. The video of Peyton and Eli Manning rapping about Fantasy Football is a viral hit with more than 3.8 million YouTube views. The brothers also did a video in 2013, which has 8.5 million views. Brands need to continue to find innovative ways to create content that is eye-catching and entertaining. Earned media is more powerful and cheaper than paid media.